What is the big deal about Fluorosis? We are often told that Fluoride will help prevent dental decay. This article is not about that. What is often not discussed is Fluorosis and in particular the dangers of fluorosis. 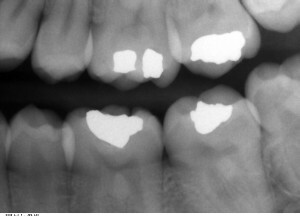 One form of dental fluorosis can lead to a phenomenon known as the fluoride bomb. 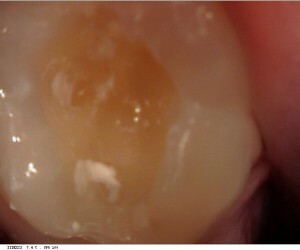 A fluoride bomb is a area of the tooth (normally the pit and fissures) that have started to decay, but due to the high concentrations of fluoride has led to the surface mineralisation of the tooth. 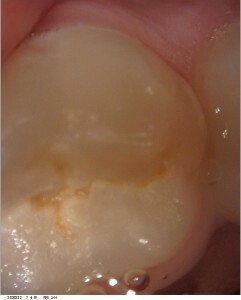 This is however only superficial as the decay will continue to extend deeper into the tooth. Sadly, because of the surface remineralisation, the patient is usually unaware of the problem until the underlying destruction starts to affect the nerve, by which time the damage is very extensive and can be quite complicated to restore. In 2010 the Centers for Disease Control and Prevention (CDC) reported that 41% of American adolescents had dental fluorosis, with 8.6% having mild fluorosis and 3.6% having either moderate or severe dental fluorosis (Beltran-Aguilar 2010). Anecdotally, these figures are consistent in our clinical experience. Here are some photos of how potentially damaging a “fluoride bomb” can be. So if you have any white spots that you think might be fluorosis, and are concerned by what is happening, contact us for a chat. Hi, iam a dental assist, I am 52, I have been a DA for 14 years all up. I could proudly say that I have no fillings. Well until today that was .... Today I mentioned to my dentists I was working with that my 4.6 was a little different today. He said we should take a xray to make sure nothing is going on. Well to my devastation there is a huge fissure bomb going on. No warnings what so ever. I brush and floss religiously. I have regular check ups and I also check them myself. In have always been taken to the dentist as a child, had fluoride treatments, and flouride tablets and in the town water aswell. 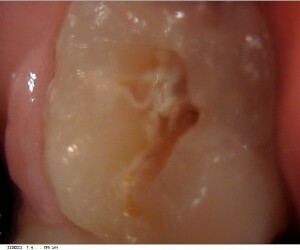 Hopefully my tooth can be saved now and no RCT is required and not too much structure is lost.